Yesterday, the Japanese yen was able to withstand the onslaught of counterdollar currencies at the speech of Fed Chairman Jerome Powell, but this resistance weakened today in the Asian session - the yen's decline is 32 points. Of course, the yen has a traditional patron - the stock market. Yesterday, the S & P500 added 2.3%. Today, the Nikkei225 is growing by 0.61%. It seems that the stock market rally has already begun. According to the data released today, retail sales in Japan added 3.5% y / y in October against the forecast of 2.7% y / y. Tomorrow, a whole block of positive changes are expected: industrial production growth in October is 1.3%, the base CPI of the capital Tokyo in November from 1.0% y / y to 1.1% y / y. Consumer confidence index is expected to be 43.3 against 43.0 earlier, the number of new housing bookmarks is from -1.5% y / y to 0.4% g / g.
At the moment, the price is close to the Krusenstern indicator lines and the balance on H4, but as part of the fluctuation, it is possible to reduce to support for the daily scale in the area of 113.00. From the level, we are waiting for the price reversal up to the resistance of the trend line of the price channel (115.15). According to the H1 time - frame, I found the upward breakout of the 6-hour balance, which is sign that buyers are in control today. I also found the rejection from the demand zone (blue shape), which is another sign that selling looks risky. My advice is to watch for buying opportunities. The upward targets are set at the price of $4.117 (Fibonacci expansion 61.8%) and at the price of $4.225 (swing high). Financial analysts at Goldman Sachs believe that the price of Brent crude oil may exceed $ 65 per barrel if the OPEC member countries agree to reduce production this week. Experts agree that the wording of the new OPEC agreement will be restrained, for example, the goal could be to stabilize the volume of commercial stocks. According to their estimates, at the beginning of next year, the price of Brent crude oil may exceed $ 70 per barrel amid a reduction in exports and the cessation of growth in reserves that exceed seasonal rates. This price level will allow for normalization of reserves, while not sufficient for an excessive increase in drilling activity in the United States. If oil quotes reach $ 62-63 per barrel, this may stimulate further growth to $ 70 per barrel. However, if OPEC does not reach an agreement on reducing production at the next meeting on December 6-7, this will lead to the continuation of a downward rally. The correction on the British pound yesterday took place even higher than the area we expected, the limiter was the balance line of the daily timeframe. On the four-hour chart, the signal line of the Marlin oscillator formed a long corridor, pushing off from its upper limit. The reason for the increased dynamics was the decision of the British Parliament to take over the authority of further Brexit process in case of failure of the May draft vote on the 11th. This turn of events has threatened the prime minister's resignation. Given that the EU may not want to process the finished project, which has been repeatedly stated, the country can leave the EU without a deal at all. So, the short-term technical growth took place, the price strengthened on the daily and H4 in the downtrend, we are waiting for the price to support the price channel line in the area of 1.2550. The British currency was under strong pressure yesterday, following the controversial fundamental background. The unexpected cohesion of the British deputies against Theresa May has caused alarm to traders, after all, after only 6 days, parliamentarians must decide the fate of the Brexit deal. On the horizon, the prospects for Britain's chaotic exit from the EU again loomed, after which the pound fell to 18-month lows. But the fundamental picture of the GBP/USD pair is very changeable: today the sterling is showing a very aggressive growth, restoring lost positions. A rich news flow keeps traders in good shape, and the closer December 11, the more acute the market reaction to any rumors related to the prospect of Brexit. However, today the growth of the pound is not due to rumors. The fact is that the leader of the Conservatives in the House of Commons, Andrea Leadsom, said in an interview that the only alternative to the deal is "hard" Brexit, that is, the chaotic exit of the country from the EU. According to her, this scenario is basic and there are no other scenarios. On the one hand, this statement should again alert traders – because just yesterday 311 members of Parliament voted to investigate the issue of disrespect of the Cabinet of Ministers to the legislature. That is, the deputies have unambiguously showed that Theresa May has no unequivocal support of the parliamentary majority and all decisions are made situationally. On the other hand, Leadsom's statement supported the British currency: the fact that the position of the parliamentary leader puts the deputies before a simple but difficult choice: either they vote for a "bad deal", or they support a "hard" Brexit. No "plan Bs", re-referendum or other half-hearted scenarios. Only forward or backward, only "black or white", without any shades. It should be noted that Theresa May is now playing this card: in almost every speech she paints a catastrophic chaotic Brexit, warning deputies that they take responsibility for the implementation of such a scenario. That is why Labour has been actively promoting the idea of a second referendum or an alternative agreement with Brussels – to convince Parliament that their choice is not limited to "hard" or "soft" Brexit. In other words, Theresa May's opponents are trying to minimize the deputies' concerns about the consequences of a failed vote for the Brexit project. The task of Theresa May's supporters is the opposite - to convince them that if they do not support the proposed agreement, they will plunge the country into a state of economic and political chaos. That is why today's statement by Andrea Leadsom is so important – in fact, she sided with Theresa May – at least voiced the message, which is politically beneficial to the prime minister. And here it is worth noting that Leadsom has a strong enough influence among conservatives. She was one of the contenders for the premiere position after David Cameron left the post. Moreover, in 2016, she even went to the last round of elections of the leader of the Conservative Party, but lost to the current prime minister – 199 deputies of the Conservative Party voted for May's candidacy, 84 for Leadsom. Later, she withdrew her candidacy, thereby opening the way for Theresa May to the prime minister's office. In other words, the supporters of the "soft" Brexit received a rather important ally, although the support is very indirect. But the bulls of the GBP/USD, apparently, use any reason of a positive nature to return the price in the direction of corrective growth. Despite the strong volatility and the likely temptation of traders to "catch the price wave", trading the pound is still extremely risky. The market reacts too violently even to minor signals regarding the prospects of Brexit, so such price movements are unreliable. In a few hours, the fundamental picture may change dramatically - if rumors return to the market that the prime minister does not have sufficient support among the deputies. Unfortunately, now we can only analyze the causes of this or that surge in volatility after the fact, while it is almost impossible to predict price fluctuations for the GBP/USD pair (as well as for other cross-pairs involving the pound). From a technical point of view, only support levels are relevant. In this case, the strongest support level is 1.2640 - the bottom line of the Bollinger Bands on the daily chart. Slightly higher is the price low of the year - 1.2660, which also acts as support - for example, yesterday, with a pulsed southern movement, the pair did not refresh this low, stopping at 1.2670. But here it is worth warning that with strong volatility, the above levels of support will not be able to resist the onslaught of bears, especially in anticipation of a key vote in the British parliament. 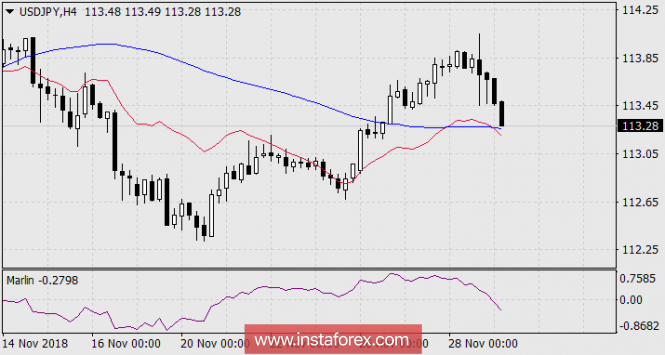 The dollar index today made an unsuccessful attempt to return to the area of 97 points: at the beginning of the US session, the greenback had once again began to lose positions throughout the market. Dollar bulls found themselves in a difficult and rather contradictory situation: on the one hand, the Federal Reserve declares a gradual tightening of monetary policy, on the other hand, representatives of the regulator increasingly say that the rate is approaching its neutral level, when its size does not hold back the development of the economy, but does not "overheat" it. That is why traders are now so sensitive to the slowdown in the key macroeconomic indicators of the United States – since this fact can reduce the determination of the members of the regulator about the prospects of monetary policy next year. Here it is necessary to make a reservation at once: market participants still lay in the current prices a high probability of a rate hike in December. Although in recent years, traders have somewhat doubted this step: if a month ago, this probability was about 80%, today it is 67%. In my opinion, these are understated figures – the Federal Reserve will not resort to "shock therapy", refusing to raise the rate for the fourth time this year. Fed members are too transparent and persistent in making it clear that they are ready to show appropriate determination at the December meeting. Therefore, the main intrigue concerns the prospects for next year and not this year. The dollar bulls have a reason for concern – several members of the Fed have recently changed their rhetoric, significantly softening their positions. For example, Jerome Powell in early October clearly stated that the rate is still "too far from neutral". However, last week his position changed - he said that the rate is "slightly below" the level that can be considered neutral. Vice-Chairman of the Fed Richard Clarid also raised this issue: in his opinion, the rate is at the lower limit of the range where the notorious neutral level is located. The minutes of the Fed's November meeting also show that the members of the regulator are gradually reducing their hawkish attitude. Thus, if at previous meetings they allowed the probability of exceeding the neutral level, this time the emphasis was placed differently. The Fed was again concerned about the slowdown in the world economy, tighter credit conditions, the decline in the housing market and other negative factors. In other words, the general tone of rhetoric has become more cautious, and this fact has alerted traders, especially against the background of subsequent comments by Powell and Clarida. According to some experts, the Fed smoothly prepares the markets for the fact that the regulator will not raise the interest rate on a "regular basis": when a certain level is reached, the Fed will take a wait-and-see position, and all subsequent decisions will be taken situationally. And here the main intrigue is when exactly the regulator will pause the process of regular rate hikes, because the above mentioned range is quite wide – from 2.5% to 3.5%. Although the issue is debatable, the fact that it is discussed puts indirect pressure on the markets. In particular, the yield of 10-year treasuries returned to three percent and continues to decline (at the moment – 2,838%). The growth of the dollar index also slowed - over the past month, the indicator tried to gain a foothold three times in the area of 97 points. Thus, the dollar does not have sufficient grounds to make a price breakthrough, but it is also in no hurry to give up its positions. As I said above, in the light of such uncertainty, traders are more sensitive to the slowdown in macroeconomic indicators: in particular, the level of labor cost, which is an indirect indicator of inflation growth, is out in the red zone. Also disappointed by the ADP report, which came out in anticipation of tomorrow's Nonfarm. Although these indicators are of a secondary nature (compared to tomorrow's release), they were able to provoke additional pressure on the yield of treasuries and, accordingly, on the dollar. Thus, the further correctional growth of the pair depends on tomorrow's Nonfarm. If they come out in the "red zone" (especially in terms of wage growth), the pressure on the US currency will increase and, accordingly, the growth of EUR/USD will continue. From a technical point of view, the situation has not changed since yesterday. The price on the daily chart is still on the middle line of the Bollinger Bands indicator, which indicates the absence of a bright trend movement. If the pair is fixed below 1.1340, then, firstly, the price will be between the middle and lower lines of the above indicator, and secondly – the Ichimoku Kinko Hyo indicator will form a bearish "Parade of lines" signal . The combination of these signals will open the way for the pair to a strong support level of 1.1250 (the lower Bollinger Bands line on the daily chart). If tomorrow's Nonfarm will disappoint, then the pair may again test the 14th figure. In Asia, Japan will release the Prelim Machine Tool Orders y/y, 30-y Bond Auction, M2 Money Stock y/y, and BSI Manufacturing Index. The US will also publish some economic data such as Core PPI m/m, PPI m/m, and NFIB Small Business Index. So there is a probability that the USD/JPY pair will move with a low to a medium volatility during this day. Trading Forex (foreign exchange) on margin carries a high level of risk, and may not be suitable for all Traders or Investors .The high degree of leverage can work against you as well as for you. Before deciding to invest in foreign exchange, you should carefully consider your investment objectives, level of experience, and risk appetite. The possibility exists that you could sustain a loss of some or all of your initial investment and therefore you should not invest money that you cannot afford to lose. You should be aware of all the risks associated with foreign exchange trading, and seek advice from an independent financial advisor if you have any doubts. So, the epic with Brexit continues: today Theresa May arrived in Brussels, where two important meetings will be held in the evening - first, she will discuss the prospects of the "divorce process" with the President of the European Council Donald Tusk, and then – with the head of the European Commission Jean-Claude Juncker. According to some information, May will also meet with German Chancellor Angela Merkel. The British Prime Minister is trying to find a way out of the current impasse: the "maximum" task at the moment is to agree with Europeans on the final date of the back-stop, while receiving the corresponding guarantees of a legal nature. Let me remind you that the main stumbling block in the British Parliament was precisely the Irish border discussion. According to the draft agreement, the special customs status of Northern Ireland does not have a time limit, which means it can become permanent. Moreover, according to the provisions of the transaction, London will not be able to waive this status unilaterally. Such vague prospects were perceived in hostility by the laborists, unionists, and the "hawkish wing" of conservatives. According to Theresa May, the majority of deputies support the key points of the deal, but the uncertainty with backstop forces them to vote against the proposed agreement. In turn, Labour states that the problem lies not only in backstop but also in many other aspects. However, conservatives and unionists voice more restrained comments. Thus, the chances of a "soft" Brexit are still there – and this explains the current dynamics of the pound, which paired with the dollar, consolidated at the bottom of the 26th figure. By and large, now the "ball" is on the side of Europe. If Brussels makes concessions and fixes the final date of the backstop, many British MPs may reconsider their decision in favor of the proposed deal. However, the other scale – the disastrous consequences of "hard" Brexit, which have already been said about. However, Europe is not in a hurry to meet. At least, the head of the European Council Donald Tusk today said that Brussels will not re-discuss the agreement reached, and even more so will not revise the issue of the Irish border. Nevertheless, the head of the EC said that the European side is ready to think about how to "facilitate the process of ratification by the British side." What exactly Donald Tusk had in mind is unknown, so his words can be interpreted in a fairly broad sense. The head of the European Commission Juncker, in turn, also rejected the hypothetical revision of the transaction. However, he admitted the possibility of a certain compromise: speaking at the session of the European Parliament, Juncker said that in the current situation, certain clarifications are permissible – but without revision of the text of the Treaty. In other words, on the one hand, Brussels categorically refuses to revise the agreement, but on the other hand, it makes it clear that it is ready to make certain concessions in the context of clarifying and interpreting the agreements reached. Thus, traders of the pound/dollar pair once again find themselves in agonizing wait: if today the parties do not sound positive signals, the price will collapse once again to an annual low, to the level of 1,2505. If the evening meetings lead to any result (even if of a preliminary nature), the bulls of the pair will seize the initiative and the price will rapidly go up. The fact is that the GBP/USD pair has a strong unrealized potential for large-scale corrective growth, especially after today's release of data on the UK labor market. The unemployment rate remained unchanged, a record low of 4.1%, but the average earnings jumped by 3.3%, while experts expected a more modest growth – up to three percent. But the increase in salaries in nominal terms for three months was the strongest in the last ten years. The growth of applications for unemployment benefits was a bit disappointing, but the indicator of earnings plays a more important role in this context. Weak wage growth rates for a long time worried the members of the British regulator – in their opinion, this indicator largely determines the stability of inflation growth in the country. But the figures published today show that Average Earnings Index has been growing for the fourth month in a row, exceeding the forecast values. All this allows the Bank of England to toughen its rhetoric and take a more "hawkish" stance at the next meeting, taking into account the growth of the consumer price index. If not for one "but" - Brexit. If London and Brussels are unable to agree on legal guarantees for the completion of the backstop, the probability of a chaotic Brexit will increase again, and the British Central Bank, in turn, will take a wait-and-see position for a long time - and under certain conditions, will reduce the rate. Therefore, the results of the next negotiations can not be overestimated: not only the fate of the deal depends on them, but also the prospects of monetary policy in Britain. In Asia, Japan will not release any economic data today, but the US will publish some economic data such as 30-y Bond Auction, Natural Gas Storage, Unemployment Claims, and Import Prices m/m. So there is a probability that the USD/JPY pair will move with a low to a medium volatility during this day. Trading Forex (foreign exchange) on margin carries a high level of risk, and may not be suitable for all Traders or Investors. The high degree of leverage can work against you as well as for you. Before deciding to invest in foreign exchange, you should carefully consider your investment objectives, level of experience, and risk appetite. The possibility exists that you could sustain a loss of some or all of your initial investment and therefore you should not invest money that you cannot afford to lose. You should be aware of all the risks associated with foreign exchange trading, and seek advice from an independent financial advisor if you have any doubts. The euro was trading fairly volatile in tandem with the US dollar, but then dropped sharply following the beginning of the press conference at which the president of the European Central Bank expressed concerns about a slowdown in the eurozone's economic growth rate at the end of this year. All attention today in the afternoon was riveted to the decision of the European Central Bank, which left the refinancing rate unchanged at the level of 0.0%. The European Central Bank also kept the deposit rate at a negative level, -0.40%. The regulator confirmed that it plans to complete net acquisitions of assets at the end of December 2018, but in the future it is also planned to completely reinvest funds received as a result of QA over a long period even after the first interest rate increase. With regard to the conditions of monetary policy, the ECB expects rates to remain at current levels at least until the summer of 2019 inclusive. ECB economists have negatively revised their forecasts for the growth of the eurozone economy over the next three years. GDP growth is expected to be at 1.9% in 2018, while the September forecast was 2.0%. GDP growth in 2019 is projected at 1.7%, while the September forecast was 1.8%. But GDP growth for 2020 remained unchanged, at the level of 1.7%. As for inflation, experts predict its growth at the end of the year. It is expected that the EU Harmonised Index of Consumer Prices in 2018 will be 1.8%, while in September it was projected to grow by 1.7%. However, it should be noted that a sharp drop in oil and other energy prices may adversely affect inflation growth at the end of the year, as was the case with the US consumer price index, which has slowed to zero. ECB experts predict that inflation in 2019 will be 1.6% against the September forecast of 1.7% and 1.7% in 2020. The speech of the president of the European Central Bank sharply pulled down the euro. The ECB president said that the latest economic data were weaker than expected, and the uncertainty associated with protectionism, emerging markets, is still strongly expressed, which may affect the pace of economic growth. Immediately after saying that a substantial monetary stimulus is still needed, the euro went down against a number of world currencies, as many experts were counting on a different kind of statement. Draghi also noted that the risks to economic growth prospects are generally balanced, but the balance of risks is shifting downwards. All this once again confirms the fact that the European Central Bank will continue to closely monitor the incoming economic data, and only a real revival of economic growth, along with the solution of a number of problems related to protectionism and political risks, will make it possible to seriously start discussing the first increase in interest rates in the eurozone after the 2008 crisis.